Your search for a grill with top-notch quality will not be an easy feat. There is a wealth of choices available. Each brand will claim that they have the best, but this should not be an excuse for you to decide in haste. To help you find a grill that you won’t regret having, this Camp Chef vs Traeger comparison will extend a helping hand. We’ll look at what the two brands can offer. We’ll also discuss two of their most popular models, which should definitely be part of your list of choices. By the time that you are finished reading, you will understand why these two brands are some of the market leaders. It’s still up to you to decide which one is a better pick! 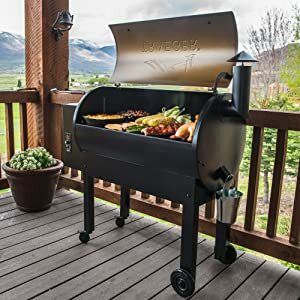 Should I buy a small or a large grill? This is probably one of the first questions that you have in mind. Honestly, I do not know the answer either! It depends on your needs. The cooking area should be proportionate to the amount of food that you wish to grill or smoke. Smaller grills are more portable and usually cheaper, but it also means that it can grill only a small quantity at a time. 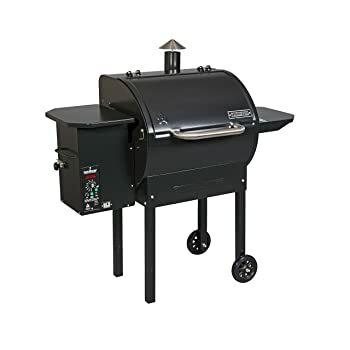 The biggest grill that you can find from Camp Chef, which also happens to be their most expensive model, has a cooking area of 874 square inches, including both an upper and lower rack. If you are looking for a smaller alternative, they have a smaller model, which has a cooking area of 429 square inches. On the other hand, with Traeger, the biggest from their grills has a cooking area of 1,300 square inches, which will be more than enough space for 12 chickens, 15 rib racks, and 12 pork butts. If you want smaller ones, their smallest has a cooking area of 173 square inches, which is made specifically for tailgating because of its portability. When choosing a grill, it is important to have a look at the temperature range that it can handle. It is better if there is a wider range, which means that you will have the freedom to set the grill based on the level of heat that you require. With most of the models from Camp Chef, the temperature can be up to 500 degrees. This is as against Traeger wherein the maximum that can be reached is only up to 450 degrees. Therefore, if you need a higher temperature range, Camp Chef will allow you to do so. This also allows you to cook in a shorter span of time because of its maximum heat output. Most of us would use pellet grills at home during special occasions with family and friends. There are also some who like grilling when they are camping or tailgating. With this, you should consider the portability of the grill, which will allow you to move it around with ease. If you want to bring it on your outdoor trips, it should be small enough to fit in your vehicle. Looking at the different models of Camp Chef and Traeger, both of them are portable. They have models with four and two wheels, allowing you to push it with ease instead of having it carried. Nonetheless, from the two, only Traeger has a model that can be folded and has no wheels. It is small and perfect for your trips. It is also important that you look at the control of the grill that you are buying, which will be great in terms of being user-friendly. It should be free from complications, making grilling a task that will be a snap for you to accomplish. Camp Chef and Traeger have controls that are quite similar to each other. They exist in the form of dials that you have to turn to choose the desired temperature setting. The range of the temperature will depend on the model. Both brands, however, will allow you to set and forget. This means that you do not have to be near the grill to monitor the temperature. Another thing that is the same in terms of control is the automatic ignition. With the latter, all that it takes is a push of a single button to get started with grilling. Wood pellets are known for their flavor and aroma. They are placed in a hopper, which makes the capacity of the latter another important consideration. If the hopper is small, this means that you might find yourself having it refilled frequently when you are grilling for a long time. With this, it is better if the grill comes with a large hopper. With Camp Chef grills, the hopper has a capacity of 18 to 22 pounds. On the other hand, with Traeger, hopper capacity ranges from five to 24 pounds. To be provided with an excellent value for money, pick a model that can deliver multiple functions. It must be useful beyond grilling. You must be able to experiment with different recipes so that you can do more with a single product. This is another area where the two brands are quite similar to each other. They can be useful for multiple cooking functions, not only grilling. They can also be used for searing, roasting, barbequing, and smoking, among other things. No one would want to have a defective grill. However, it is inevitable that grills will malfunction over time. This is where the importance of a warranty enters the picture. When it is still under warranty, you will be able to have it returned and you can enjoy free repair or replacement of damaged parts, depending on the terms specified by the manufacturer. Camp Chef and Traeger have warranties that both last for three years. To be eligible for the warranty, make sure that the unit is not repaired by unauthorized companies. Also, the problem should not be a result of your negligence. and Traeger TFB65LZBC Texas Elite 34 Wood Pellet Grill. In terms of its cooking area, this model will not be a disappointment, even for a large household. The main cooking area is 429 square inches. More so, it has a secondary rack with a size of 144 square inches. With the use of this grill, you will be able to easily set the cooking temperature from a minimum of 160 to a maximum of 500 degrees Fahrenheit. This is better than the Traeger grill mentioned below, which has a maximum heat of 450 degrees. If you are the type of person who likes to move grills in different places, or even bring it when you are camping or tailgating, this can also prove to be a great choice because of its wheeled design. Cleaning the unit should not be too much of a problem on your end as well. It has a patented technology for cleaning ash. There is also an innovative grease management system so that cleaning after grilling does not need to be complicated. The grill grates are made of enamel coated cast iron, unlike the one from Traeger that is made of porcelain. This material is also known for its durability and is effortless to clean. The main body of the grill, on the other hand, is made of stainless steel. The built-in shutdown mode is also a great feature of this product. In the case of other models, you have to purchase it separately, which can make the grill even more expensive despite its already high price. This is also a great choice if versatility is what you are after in search of a pellet grill. You will love the fact that it can offer 6 functions in one product. Aside from grilling, it can also be used for smoking, baking, roasting, braising, and barbecuing. This makes it the ultimate companion for home cooking. The grilling space of this model is 646 square inches. Such a space is more than enough to grill six chickens, nine rib racks, or 24 burger patties. While it has many uses, it is also worth noting that it is user-friendly. Its use is free from complications. One thing that makes this possible is the electric ignition, which allows the unit to start automatically with a press of a button. The Digital Elite Controller is another feature that makes this model a notable option. The latter allows you to make easy adjustments of the temperature based on the intended application. You just have to turn the knob. It has a maximum setting of 450 degrees Fahrenheit. Aside from the controller, the unit also comes with a LED display. The latter will accurately show the current temperature to easily monitor the progress of grilling. If you are looking for portability, you will also be impressed with this unit. It can be quite heavy and big, but the good thing is that it also comes with wheels, similar to the model from Camp Chef that has been mentioned above. This will allow you to move it around without having to exert too much effort. This model comes with a porcelain grill grate. This material is impressive not only in terms of durability, but also when it comes to ease of cleaning. If you want a grill with a larger cooking area, Traeger is what we can recommend since they have up to 1,300 square inches of cooking area. Between the two brands, Traeger also has the smallest available, which is ideal for tailgating. Camp Chef has a higher temperature range, which can reach a maximum of 500 degrees Fahrenheit. This is against Traeger pellet grills with a maximum of only 450 degrees. Both brands have models equipped with wheels for portability. Traeger, however, has a pellet grill with a smaller size, which is ideal for outdoors. Their controls are also pretty much similar. They have a dial that you have to turn to set the temperature. They also have automatic ignition. If you want a multifunctional grill, both of the brands have something to offer. More than grilling, you can also use them for smoking, roasting, and searing, among other things. The grills from Camp Chef and Traeger both have warranties that last for three years. The highest hopper capacity of Camp Chef grill is 22 pounds while for Traeger, it is 24 pounds. We have also compared two specific models above, both of which are equally great. Picking a winner between the two is a bit of a challenge. What we can say is that they are both great and can offer value for money. Camp Chef wins. More features at a better price.